I haven’t used an SLR camera ,but I’m planning to buy as a gift to my daughter who’s having her first baby (my 1st grandbaby!) comes June. May I request for your advice on what kind to buy? (including needed accessories) I’ll appreciate your help on this as I want a camera my daughter will treasure for life. Thank you very much and a Prosperous New Year to you and to your family! Hello, the short answer is, go with the Canon T3i or the Nikon D5100. 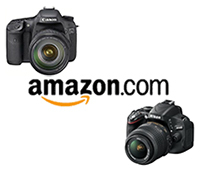 They are each high-quality and highly capable cameras, but are also designed for new and intermediate dSLR users. This allows them to be a bit easier to start out with than the upper level cameras, yet they share the same image quality and many of the capabilities of those higher models. Also, be aware that no digital camera will last a lifetime. While it should last at least 5 years if not many more, cameras become outdated and obsolete, like any other electronic, and can start to “wear out” and malfunction after a certain number of years. It lists accessories for the T3i, but the Nikon ones will be similar – just look for the Nikon version of the battery, lens, etc.